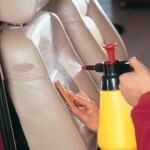 Recent reports and test show that a dirty car can be health hazard as well. In March the Daily Record printed an article called ‘Is Your Car As Dirty As A Toilet Seat?’ which reported that ‘THE average family car is crawling with more germs than a toilet seat’ and ‘Samples taken from a handful of vehicles revealed up to 21 billion bacteria found’. These are cars used by ‘ordinary motorists for day-to-day driving.’ and ‘cars belonging to dog owners all had traces of potentially lethal e coli.’ The article also explains that ‘even the cars which looked clean inside still hid billions of germs in crumbs of old food dropped by children, dog hairs down the back of seats or coffee stains round the cup holder.’ and points out that ‘Most of the owners admitted they rarely valeted their cars.’ A regular GleamGenie valet helps keep you and your family safe from these harmful bacteria found in most cars.